To achieve the skills necessary to run effective public works departments, leaders are turning to new training programs. Charles Jordan graduated from the University of North Florida with a masters of public administration (MPA), but he still looked for something to set him apart from others in the world of public works. In his seven years as a facilities manager in Largo, Fla., he has grown to appreciate the wide scope of responsibilities of public works professionals, and he wants to broaden his education to focus on local government operations and, especially, public works. As the field of public works and utilities grows in complexity and scope, more rising leaders, like Jordan, are pursuing additional training to go beyond the traditional technical skills required to maintain roads and manage other critical functions. 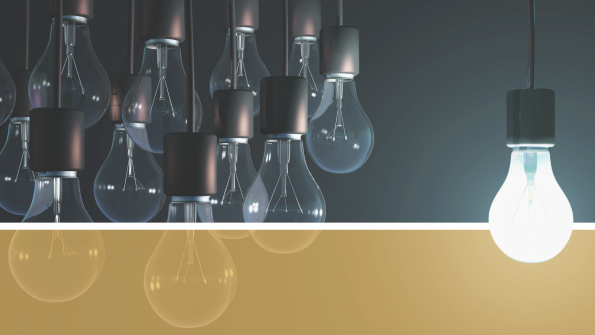 Through their associations and specialized university programs, local government leaders can today pursue certificates in specific fields like utility management, formalized credentials as a public works executive and intensive instruction through a leadership academy. 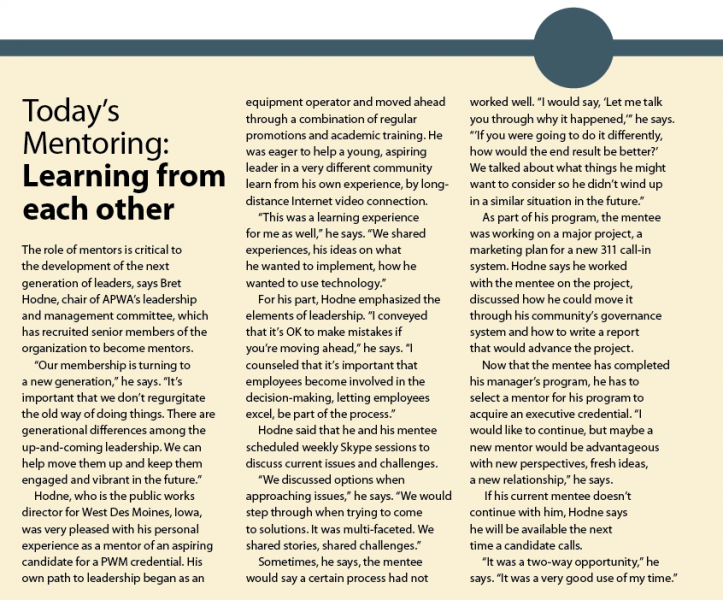 The normal path of advancement in many communities to the top of a public works department leaves many managers without training, in areas beyond the scope of the skills they need to perform the technical aspects of management, says Larry Frevert, past president of APWA of Kansas City, Mo. 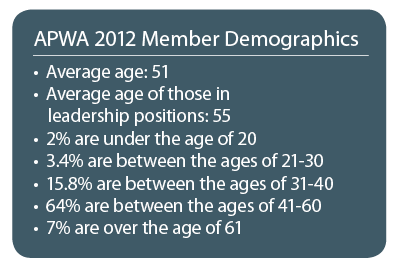 There is a need to respond to the aging of the profession, says Peter King, executive director of APWA. His organization, which has 28,500 members, has offices in Washington and Kansas City, Mo. “We have to make sure that the leadership of the future has the skills necessary to do the job,” he says. National associations are stepping up to broaden their educational programming to offer curriculum to build leadership skills that often are difficult to develop on the job. For example, the American Water Works Association (AWWA), based in Denver, provides a variety of programs on all phases of management for its membership, which includes many engineers and operators who require continuing education to maintain their state licenses. It also offers another series of classes on technical and management challenges facing the industry. AWWA has also added courses on general management training to its already comprehensive curriculum of online and conference training on subjects as diverse as water treatment, utility finance and regulatory issues. These new courses are focused on training new managers or improving current management knowledge. Taking a comprehensive approach, APWA has developed a credentialing program for current public works employees and others who want to specialize in the field. Donal Hartman manages the New England APWA chapter’s Institute that offers a broad range of training on all aspects of public works leadership. He also taught public works at Norwich University in Northfield, Vt. (See sidebar, page 18). The Institute and 16 other chapter-run programs were developed with the national APWA and offer 90 hours of instruction over two-to-three years. The instruction delves into subjects beyond the more technical classes, such as fleet management. Attendees who complete the program receive a certificate. “They teach skills in management and leadership and how to use leadership.” Hartman says. Edward Gottko, the current president of APWA, says that public works leaders saw a need for higher-level coursework, with public works performance in mind. According to APWA, its chapters’ Public Works Institutes, such as the public service education of the Illinois and Michigan chapters’ Institutes, and other programs help first-line supervisors, as well as managers and leaders who are looking to improve their knowledge and skills. APWA has created a credentialing program through the APWA Donald C. Stone (DCS) Center for Leadership Excellence that incorporates the instruction at the Institutes and additional work with mentors to gain relevant public works experience to earn designations of Public Works Supervisor (PWS), Public Works Manager (PWM) and Public Works Executive (PWE). 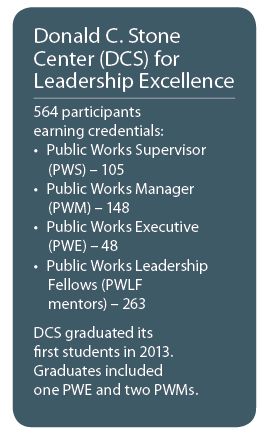 As a senior service designation, the Public Works Leadership Fellow (PWLF) is given to experienced public works professionals who agree to mentor professionals seeking credentials. Jordan, whose previous MPA work allowed him to enter the executive program, gained the highest professional designation, PWE, after completing a major project under the supervision of a mentor and defending it in a simulated town council meeting. The Institutes cover 11 core units, although each chapter can emphasize different elements of each of the units. Some of the topics in the leadership unit, for example, include Team Development, Ethics, Defining Excellence, Developing a Personal Leadership Strategy, Embracing and Executing Change and Creating a Learning Organization. One path to gain leadership skills is through APWA’s Emerging Leadership Academy, which is a 10-month program that provides intensive leadership and management training within the context of public works. Many agencies and organizations recognize the importance of professional leadership training when hiring and promoting managers and supervisors. The Academy’s intensive training in core leadership and management skills also prepares individuals for leadership in the broader profession. “It’s team building, negotiating, media training to become leaders in the public works profession,” says Susan Hann, city manager of Palm Bay, Fla., who leads the academy. Hann worked her way through the public works ranks, primarily as a traffic expert, and has been the city manager of Palm Bay for the last two years. Through a rigorous selection process, the program identifies candidates who have worked in the field of public works for less than 10 years, but who have received strong endorsements from their employers. Employers must commit to allowing participants to devote a substantial amount of time to the program during the year. Each class consists of 16-20 individuals who participate in monthly calls, attend a two-day training session in Kansas City, and complete required class assignments. They also complete a class project, which is presented at the annual convention. 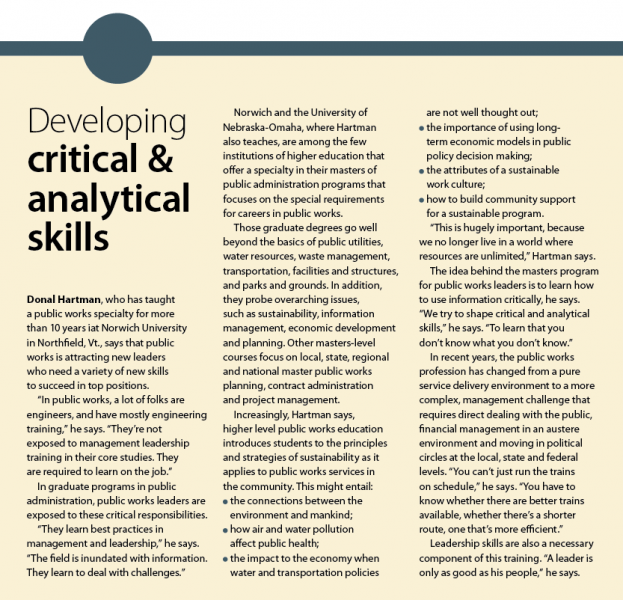 While the public works profession is devoting significant resources to developing its new leaders, it is also seeking to maintain its expertise in specific skill areas. APWA offers three certification designations, earned through education, work experience and testing: Certified Public Infrastructure Inspection (CPII), Certified Public Fleet Professional (CPFP) and Certified Stormwater Manager (CSM). Certified professionals must continue their professional development by earning continuing education units and must be recertified every five years. King says the thrust of the training regimen is to develop a source for the body of knowledge that up-to-date public works professionals need to do their jobs at the highest level and to lay down a clear path for those who want to make public works their career. “Methods, tools, knowledge, across all of the areas,” he says. “We want to establish the standard operating procedures, not just focus in one area,” he says. In the future, the association plans to offer a credentialing program for professionals, such as planners, scientists, engineers and consultants, who do not work for government agencies but want training in specific aspects of public works operations that they encounter in their own work, often side-by-side with the government public works leader. As a graduate of the credentialing program, Jordan says he is committed to a career in public works because of its unique relationship with the public. From that process, he and his mentor created a professional development plan that established goals and set regular benchmarks to gauge his progress. His capstone project on fleet management allowed him to delve more deeply into areas of the operation that he had not previously encountered and build relationships with workers whom he had not known well.